In case you were wondering why I haven’t posted in almost a week, I’ve been up to my eyeballs in XML files, CSS codes and whatchamacallits to move my blog over to my own domain. I’m now at PopCultureNerd.com and will no longer be posting here. I just posted my thoughts and reactions to the Golden Globes so come join the party over there! I know I’m in full-on nerd mode when I say this but I’m happy season 9 of Idol has started! Yes, this show can be corny and full of deluded, scary folks, but every once in a while they get it right and find a real star among the wannabes (I loved Kelly Clarkson and Carrie Underwood during their respective seasons). Also, while I covered season 8 last year, Poncho dropped by, became one of the most insightful and witty commenters about the show, and has since continued to hang out here and become my cyber buddy. American Idol brings people together! My favorites include Benjamin Bright with his smooth Aaron Neville-esque delivery of the Beatles’s “All My Loving,” the stunning Ashley Rodriguez (push-down-the-stairs alert!) and her rendition of Alicia Keyes’s “If I Ain’t Got You,” Katie “I Love My Portuguese Grandma” Stevens doing “At Last” better than Beyoncé at the Inaugural Ball, and Justin Williams, who made ME feel good when he sang “I’m Feelin’ Good,” Michael Bublé-style. I’ve said it before but I’ll repeat myself here: Having Victoria Beckham judge a singing contest is like having Stevie Wonder judge Project Runway. How would she know anything about good singing? Everything was “nice.” Sample critique: “You have a nice smile, nice look, nice voice, nice personality. I say yes.” Thanks for that. Most supportive relatives go to Amadeo Diricco‘s Italian clan, Bosa Mora‘s Nigerian folks, and Katie Stevens’s huge family who made Ryan Seacrest cry. Funniest critique—Simon’s dissection of Norberto‘s audition, saying how weird it was that he sounded like a three-year-old girl but looked like LaToya Jackson with a beard, made me laugh. How will we manage without our favorite judge next year? Who could possibly replace him? Did you spark to any singers last night? 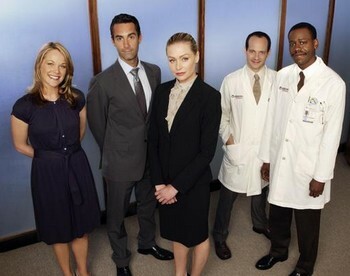 After Idol, I switched to Better Off Ted on my DVR list. Please, please, please watch this show so it won’t die. The laughs-per-minute ratio is higher than any other show currently on and yes, that includes Modern Family and Glee, two of my favorites. Because higher-ups won’t admit they meant “NOT” instead of “NOW,” employees, even meek ones, let fly an endless barrage of rude insults at each other. The putdowns get more creative as people become more empowered and start enjoying telling others how they really feel. I laughed so hard, I had to repeatedly rewind to catch all the dialogue. Even if you don’t watch much TV, sample it on ABC.com or hulu.com (the episode I mentioned is number 208, titled “The Impertence of Communicationizing”). I guarantee you’ll laugh. If not, come back here and tell me off since you must NOW use offensive language in the comments! While I didn’t love Elizabeth Gilbert’s Committed: A Skeptic Makes Peace with Marriage (read my review here), I really liked this one activity she described doing with her lover Felipe. No, not that kind of activity; it’s more a storytelling exercise. She’d ask him to tell her a personal memory built around a trigger word, a random one from the top of her head. When she asked for a story about fish, Felipe told a poignant tale about fishing trips with his father when he was six. I wanted to try this out so I asked hubby to give me a random word. He said, “Socks.” I immediately went to a memory of when I fled Vietnam at the end of the war and my mother said I could bring only the bare essentials. I brought one change of clothes but forgot socks. So I wore the pair I had on when we left—white bobby socks with a red flower embroidered on the cuff—for over two weeks, until they turned brown with dirt and stiff with sweat. They could stand upright by themselves. I eventually ditched them somewhere and went bare in my Mary Janes the rest of the way. Hubby and I used several more trigger words and told each other stories, some about things we hadn’t thought about for a long time. It proved such an interesting exercise, I decided to try it out here. Tell me the first thing that comes to mind when you hear “socks.” It doesn’t have to be a long or life-changing tale. Any random thought or memory qualifies. I just want us to flex our creative muscles and learn fun things about each other. If I get a lot of comments, this might be a regular feature, maybe once a month or bi-monthly, with a different trigger word each time. But meanwhile, let’s talk about socks!